When you think 'green,' asphalt paving probably isn't the first thing that comes to mind. You might be surprised to learn that asphalt can be green and environmentally friendly. Porous pavement allows water to flow through it rather than shedding water, reducing water runoff and returning water naturally to the water table. 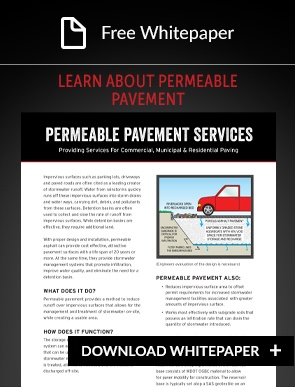 Learn more about porous asphalt paving. At Wolf Paving, recycled materials play a key role in crafting environmentally-friendly custom asphalt solutions. About 90 million tons of old, removed asphalt pavement are crushed and recycled in new asphalt annually in the U.S. — nearly double the combined total of recycled paper, glass, aluminum and plastics. 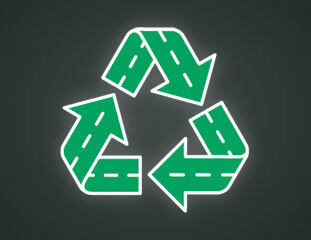 And Wolf Paving is leading the charge by recycling 100% of the asphalt it removes from job sites. By recycling these materials to manufacture new asphalt pavements and base materials, Wolf Paving is able to ensure these items will not end up landfills. In addition to construction materials, used oil from vehicles, machines and construction equipment helps fuel the production burners at Wolf Paving's asphalt plants. Wolf Paving also accepts asphalt and old concrete removed by other contractors for recycling — thereby decreasing the need to degrade the landscape in search of precious natural resources. The innovative recycling procedures used by Wolf Paving turn these cast-off materials into the highest quality asphalt available. Wolf Paving has developed more than 20 custom asphalt mix formulas to meet a broad range of project types, so you get the best mix every time. The beauty of your project is just as important as protecting the beauty of our natural resources. With Wolf Paving, you get the best of both worlds.